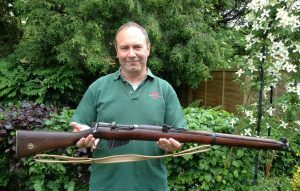 Tony is the owner of Rifleman Tours and works as the principal battlefield tour guide. Tony’s interest in military history began with the Napoleonic era and the first battlefield he visited was Waterloo. His family all served during World War Two. His father was at Dunkirk and went on to serve with the 8th Army in North Africa and Italy. He also has a strong connection with the Great War. His grandfather William James Eden, who as a professional soldier was serving with the 2nd Battalion Kings Royal Rifle Corps, was killed on the 31st October 1914 at First Ypres during the battle of Gheluvelt. He is remembered on the Menin Gate. Tony has no picture of his grandfather and would dearly love one so if anyone out there has a picture of Rifleman W J Eden, a copy would be most appreciated. Tony has guided many battlefield tours over the years working with many groups and associations and regiments. Recently he was the lead guide for a ‘Joint Defence Force tour’. 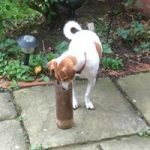 Tony has written a number of published battlefield articles and helped authors research books on the subject of WW1 and 2, most recently The British Shell Shortage of the First World War by Phillip Harding. Tony is married to Allison and they have a daughter Olivia and a mad Jack Russell called Monty. 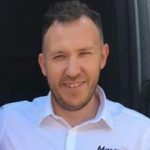 Allison shares her time between her ‘proper’ job as Media Relations Manager for a car importer in Milton Keynes and working with Tony for Rifleman Tours. 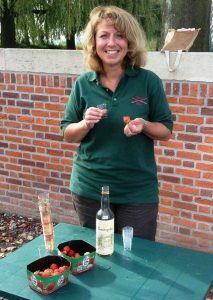 Her skills at arranging events and attention to detail, helps Rifleman Tours put together their excellent battlefield tour packages. On our battlefield tour she acts as tour manager, ensuring the welfare of our guests is taken care of and she is the queen of serving refreshments! Allison’s family has a strong military connection. 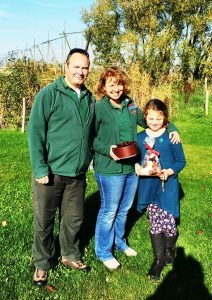 Her father, Robert, served with the RAF and her Grandfather and Great Uncles served in the Great War. 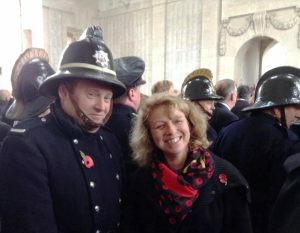 Allison’s Grandfather served with the Ox & Bucks Light Infantry and was at Fromelles where he was gassed. Upon his return to duty he transferred to the Machine Gun Corps and after a period of time serving in the Western Front, was transferred to India. Olivia cannot wait for the day when she can come on all of the tours. 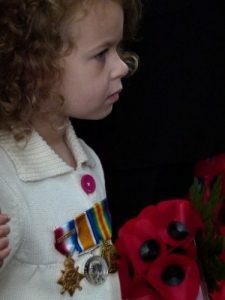 For one so young, she has a great interest in the First World War and World War Two and wears her Great Grandfather’s medals with pride when leading her Brownie Troop in the Armistice Parade. When on a battlefield tour with Rifleman, she counts our guests on and off of the coach making sure no one is left behind ‘or forgotten’. She is also ve ry good at handing round the biscuits and snacks. 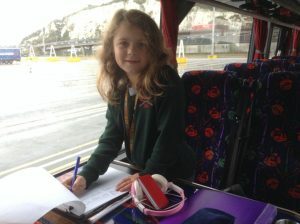 In her spare time, Olivia likes to dance – Rock n Roll, Freestyle and Tap and take part in theatre productions. Olivia has visited the battlefields many times and Ypres is her favourite place to stay – not just for the ice cream and chocolate. Her favourite trip was the Cat Festival Weekend (click here for the photo gallery of the Cat Festival Weekend). 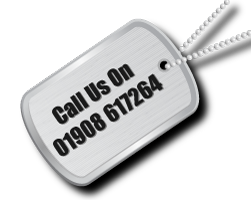 Our drivers play an important part in our organisation and we believe in Les and James we have the very best. Les has been driving coaches since the 1970’s and works for Richmond’s Coaches (click here for website link). He is an expert with any size of coach from an 80 seat double-decker to a 25 seat executive coach. 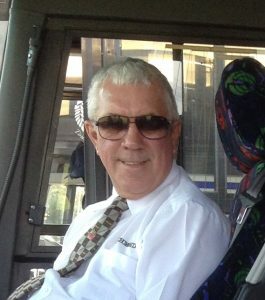 Les is always keen to ensure his passengers are comfortable and is the first to help them on and off of the coach. He also helps with refreshments on board and makes a wonderful cup of tea. Les is married to Kate and has recently become a grandfather for the second time. James is the owner of Masons Coaches (click here for website link) of Cheddington and has been driving with Rifleman Tours for four years. 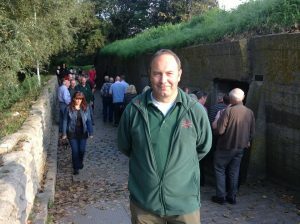 James usually works our smaller battlefield tour parties with his 16 seat executive minibus. Due to its size James has taken us across some of the most inhospitable battlefields where we get up close to where the action took place. James is married to Candice and has a daughter. 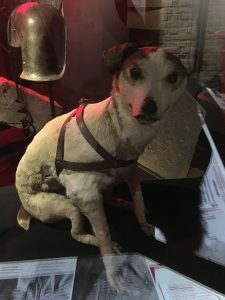 Monty is a 6 year old rescue dog who guards the office and has a close connection to World War One and Two. 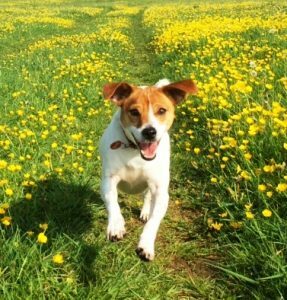 His distant Jack Russell relatives kept the trenches clear of rats in the Great War and he is named after Field Marshal Bernard Law Montgomery. In his spare time he likes to bark at postmen, chase cats and take long walks. 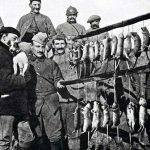 Pictured above left is Torpille the Jack Russell who belonged to a Jules Van Neste, a Belgian Chaplain in World War One and used as a rat catcher. Torpille can now be found in the In Flanders Field Museum in Ypres.